My Mayamiko pants arrived! I love the wide, cropped cut and organza trim. 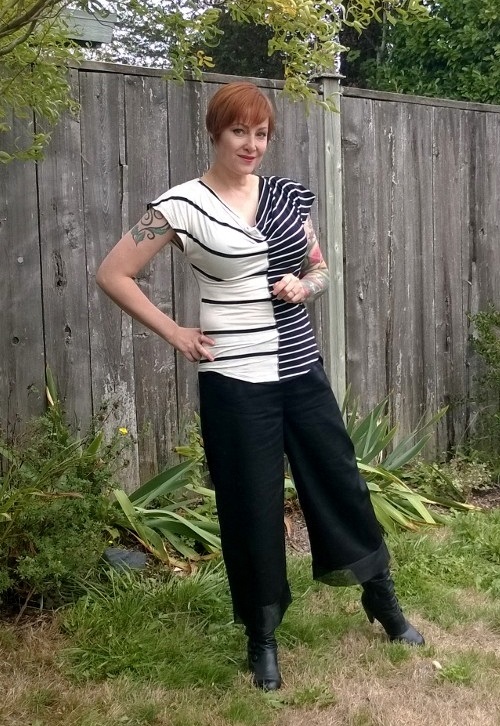 I was recently gifted a Mayamiko top and fell in love with the soft cotton fabric and solid construction. Their mission of helping women struck a chord with me as well. So I ordered these pants when I saw them on the site. If you order something by Mayamiko, remember that the sizes are UK. I’m a 6-8 and the UK 12 fit perfectly. Of course the elastic waist meant there was wiggle room—I didn’t have to worry about an exact fit. 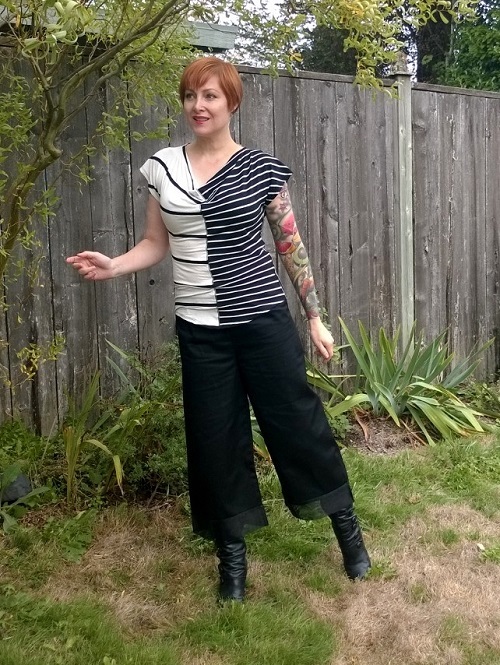 I paired my culottes with a neat two-tone top from my friend Andrea. She’d contributed it to a recent clothing exchange and I picked it out. I gravitate toward her items because she has fantastic style. If my boots look familiar, it’s because Andrea wore them in the fashion shoot I linked to in the previous paragraph. I love extending the life of clothes and shoes my sharing among friends. These are in my closet now, and I have a couple of pair of shoes for her. I really love how your pants look, they match perfectly with your shirt and boots , great outfit to be dressy and comfortable at the same time during the fall season. Have a good day !! Fabulous outfit Jean! You look gorgeous! 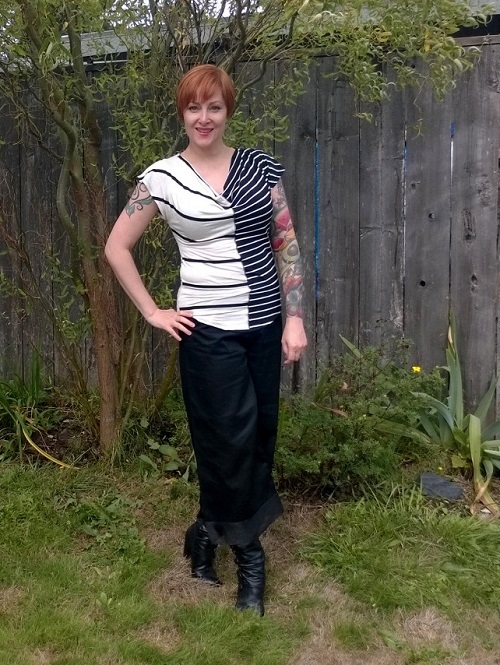 I love the stripes: white with black stripes on one side and black with white stripes on the other half, so neat! The culottes are an updated version from ones I used to wear in the 80s and the organza trim is beautiful. Wearing them with boots is the way to complete this outfit. 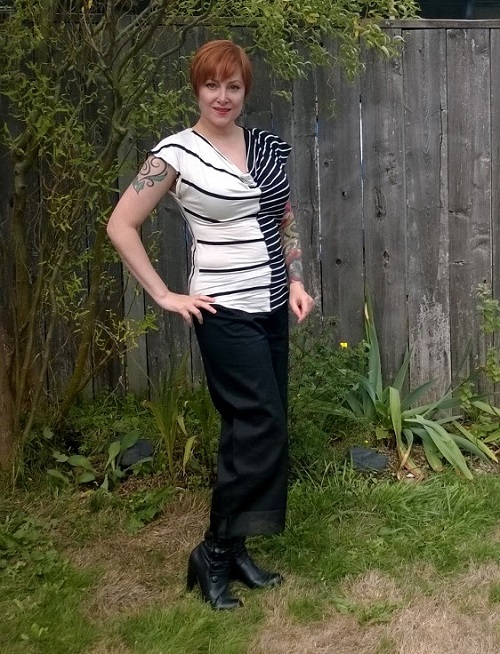 My opinion–gauchos and culottes need to be worn with boots. Glad you like it! Stripes are a classic, aren’t they? I agree that boots are the best way to wear gauchos. At least heels, but boots preferably.